As the request for fast service increase among customers, more stores are investing in self-checkouts. But even though the demand for the technology is high, customers and retailers still struggle with the actual use. Changing a habitual shopping behaviour is tricky, but possible with the right implementation. Before investing in self-checkouts, it´s important to evaluate different options. And by this we don’t only mean options as in different distributors of self-checkouts – you also need to think about how to implement them in the best way and what purpose you want them to fulfil for your store. Different stores require different ways of implementation. The key thing here is to understand your store and your customers’ shopping behaviours. The first step is to get your store checkout process analysed. This is crucial before implementing self-checkouts. A thorough store analysis isn’t complete without POS data modelling – this technique uses data from the actual store to model different checkout scenarios that could impact future self-checkout areas. The analysis should also include customer observations and store interviews. A number of factors related to the self-checkouts should be analysed. Maybe the store is located nearby a train station or sports arena and prone to attract larger crowds of customers but just during short periods of time? This may impact the number of self-checkouts you should implement. Also pay attention to the typical customer profiles, their preferred carrier type (trolley, basket, bringing items in hands) and bagging preferences. All these factors will impact the optimal setup. Another factor is the size of the store. Are we working with a smaller grocery store or a large supermarket? Where in the store you should implement the self-checkouts may vary depending on the shape, size and function of the store. Another thing you need to include in the analysis is your customers shopping behaviour. What kind of special items do your customers buy and how many throughout the week? The answers to these questions can, for example, help you decide if you should combine your self-checkouts with a Select & Collect solution. This could be a good idea if a lot of your customers buy items with age approval, such as cigarettes. The analysis can also help you calculate potential savings on labour costs, identify key success metrics and pick suitable measures of security for your self-checkouts. Are you aware of the SCO paradox? Learn more here “The SCO paradox – faster or slower?”. When installed, how do you get people to use the self-checkouts? This goes for both customers and staff. You need to create positive experiences around the self-checkouts, and above all – positive first experiences. For this to happen you need to focus on making the process as easy as possible. The best systems are the ones that are so easy that you don’t have to learn them – the use just occurs naturally. Phones are a great example of this. All you need to do is dial and press the green button. Self-checkouts can be as simple as phones if we implement them in the right way. First, you have to educate the staff on how to invite customers to try the self-checkouts. During peak hours, encourage the staff to talk with customers standing in line and encourage them try the self-checkouts instead. The staff should inform them of the benefits and give them all the help and support they need in the beginning. When implementing self-checkouts, you should also work to reduce interventions since they create a negative experience for the customer. Be aware of the interventions and work in a proactive way to evaluate the technical failure behind each one of them. Some items are extra prone to cause interventions, be aware of which ones – problems should be fixed, not repeated. • Analyse the store with special data modelling, customer observations and store interviews. • Create positive first experiences with the self-checkouts for both the customers and the staff. • Choose the right location of machines in your store. • Educate the staff on how to invite customers to try the self-checkouts. • Reduce interventions by being proactive and resolve the root of the issue so it won’t occur again. To sum up – know your store and your customers. Make sure the staff is onboard and be aware of that a customer-centric perspective is key when implementing self-checkouts. 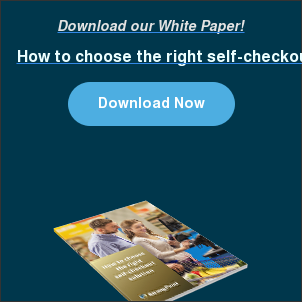 For more concrete information about self-checkout implementation, download “How to choose the right self-checkout solution”.